Learning Common 2: Our New Immersion Phase Begins! Our New Immersion Phase Begins! We've come to the end of another fantastic week of learning in LC2! We completed our first round of Immersion, 'Art Attack'. We are in the process of displaying our end product - A collaborative mural using different media to portray emotions. It's on the grey wall at the end of our learning common. Please come and have a look when you get the chance. We have already launched in to our next round of Immersion which is focussed around Interaction and will cover four main contexts - Continuity and Change, Personal Growth and Development, Positive Attitudes and The Economic World. So far we have thought about what being healthy looks like, sounds like and feels like. We worked in small groups to create a brainstorm. We also started to think about the types of food that we could have a lot of, some of and a little of. 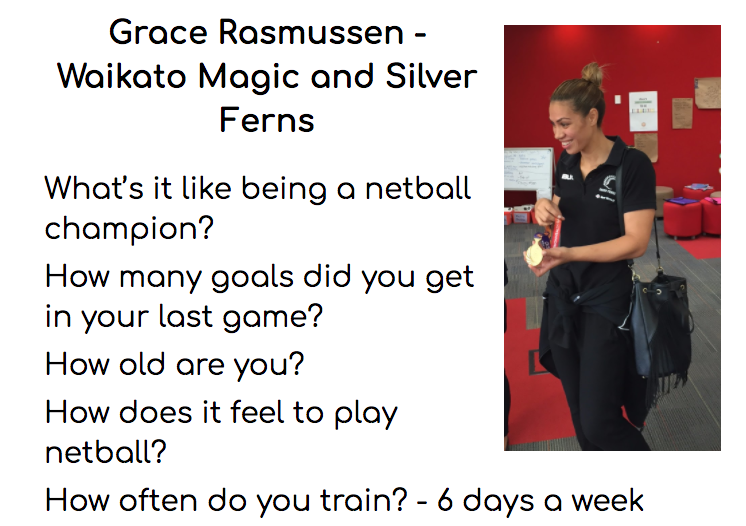 On Thursday we were really fortunate to meet Grace Rasmussen who plays for the Tall Blacks. 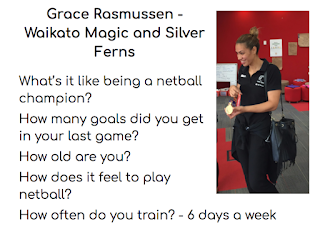 We had the opportunity to ask her some questions about being healthy. This coming Monday and Tuesday we are going to participate in workshops led by the team at ASB. In preparation for these workshops we have started to explore and play with money!!! We looked at the different coins and notes we have in New Zealand. We also started to explore the difference between needs and wants. Meela explained 'A need is something you absolutely need to survive and a want is something you would like but that you don't need to survive.' We cut out images from different catalogues and brochures to represent our thinking. This week we ran our first full PINs programme. We had a wide variety of workshops on offer and most had been carefully thought out and well planned. Every Monday we will spend time with the workshop leaders, reflecting on how their workshops went and what improvements/changes could be made for next time. Workshop participants will also have the opportunity to give feedback and feedforward via a Google Form. Painting flowers with Vrinda and Zoe. Singing with Issa and Meela. Sewing bunting with Luca and his Mum. Dancing like Michael Jackson with Alfie and Joshua. Breakdancing with Finn and Franiu. Baking cookies with Neeve and his Mum. Karate with James and Nathan. Cricket with Suah, Ashley and Haylynn. Bug Hunting with Lucas and Nikhil.